The Downtown Phoenix Podcast has a new home for its original eight-episode season. Back in 2014, I worked on a project called The Downtown Phoenix Podcast. While production of new content for the Podcast has been on hold for the past 4 1/2 years, I thought it would be appropriate to put a snapshot of that work on my new website (which, by the way, has a new set of servers hosting it!). What’s fascinating is that even though we’re nearly five years removed from the production of those eight episodes, a lot of the content is as timely as ever. That was one of the goals of the project: to be relevant whether it’s 2014 or well into the future. It was also an effort to create some sort of serious journalism about central-city Phoenix issues. I had drafted a set of editorial principles to guide the Podcast‘s direction. A lot of people ask about its future. “Is it coming back?” I certainly hope so! The challenge, as always, is time. I wanted to do a good job on The Downtown Phoenix Podcast and produce important content, which takes a lot of time to do. Fitting in production time into my schedule and my other projects is rather challenging. But if a central-city Phoenix organization is willing to take it on, then I’m willing to chat. I’m even thinking of my own ideas, too! This was a project that I still remain incredibly proud of and I hope its new home shows that. 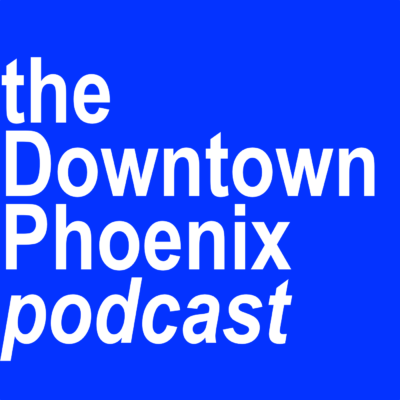 Click here or on the big blue “The Downtown Phoenix Podcast” button to see it.